Well, I'm back from my ski vacation. I'll tell you, as difficult as I thought it would be to come back, it was even harder than I imagined. It's not that I hate Toronto. I don't. I like much of my life here: my friends, my family, my job, my house. But I had a great vacation and the freedom, beauty, activity and bonding that I experienced there is difficult to peel myself away from. Is it strange that I have the most fun travelling with members of my family? It seems sometimes that they are the ones who enjoy doing the same things as I do. We all realized that we're very lucky to have this relationship. Although it makes it difficult that we're kind of scattered around the country. I'm so glad Jen lives in Calgary, or I may never have gotten into the sport this actively. I can't believe how much I've improved since I first started going out there for our annual skiathon. 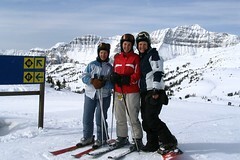 As you can see by the sign, we're black-diamond skiers now! We're really quite proud of ourselves! We got rained out in Fernie, BC, but managed to get fantastic conditions everywhere else we went: Kicking Horse in Golden, BC, Lake Louise (where we got FREE passes!) and Sunshine in Banff, AB. By the last day of nonstop skiing, we were tired. Tired, but sad to leave. And now here I am in Toronto, putting my photos on the internet (Facebook users can see them for now here, but those not on Facebook can check them out on my Yahoo 360 space by clicking here), cleaning out my luggage and doing laundry. It's so tempting to change my life right now and just do something totally different with less responsibility, more adventure. I'm SO craving a change.